﻿ The Development Of Downspout Machine - RISHBIN WUXI CO., LTD.
Metal downspout machine makes a great improvement over the past years of developing by leaps and bounds, because the metal downspout machine and equipment actually already occupied our whole major field of roll forming machine equipment, and the metal downspout machine and equipment has played a very important part in the whole equipment industry in China. Therefore, with the development of the whole environmental protection market, the downspout roll forming machine will become more and more important. For downspout forming machine, the common forming methods mainly include pressing, forging, extrusion and welding, so that the equipment can be formed. And the method can explain the forming method of the equipment, we need to buy some ready-made good forming equipment. Many roll forming machine manufacturers are constantly developing new products and materials, while the hot rolled steel is gradually adopting the cold bending steel, which is believed to be obvious to all. Rishbin, as one of the leading roll forming machine manufacturers, produce high quality downspout machines for sale, welcome to inquiry. Modern enterprise collectivization, production capacity scale, many varieties, little batch production mode, the robot downspout machine application needs become wider. 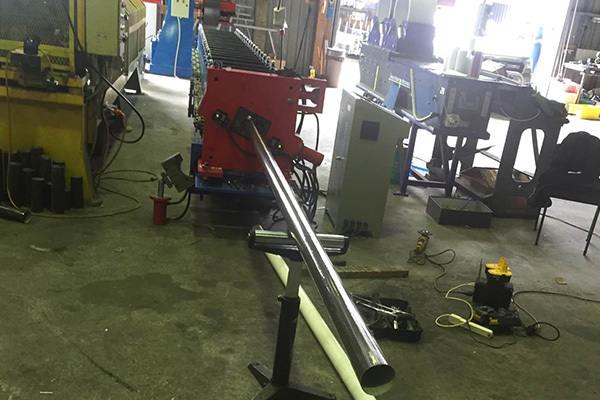 The market not only requires the downspout machine to develop in the direction of high speed, but also have the ability to handle multiple products, achieve more products, one machine in one line. The morphology, structure, size of each target object is different, the actuator at the end of the downspout machine structure and the way to the operation of the target object is different also, target replacement, downspout machine system program also should make corresponding changes, it will not be able to adapt to the high speed of modern enterprise production, many varieties, the present situation of the small quantity.